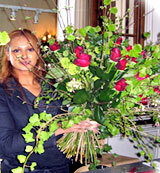 A floral school devoted to the Living Arts..
a Day of Floral Creativity! Learn the latest design styles, color trends & secret techniques used by master floral designers in flower designing classes. After a demonstration, our instructor will guide you through the creation of your own floral masterpiece to take with you! At School of Flowers, we offer a wide range of floral programs, from career building programs for the professional floral designer to special interest classes for personal enjoyment. As a flower school, located in Boca Raton, Fl, we provide floral design classes to corporate conventions, private parties, clubs and groups. advantage in seeking successful and rewarding employment, or in starting and operating their own floral business. Our Everyday Classes here at the Boca Flower School are designed for beginners, but are challenging enough to be enjoyed by experienced designers. For a more intense experience, check out our Master Level Classes offered during the summer at our Boca Flower School. Each fun and informative class focuses on one floral concept. As you create a beautiful arrangement, you will learn care & handling techniques, the elements and principles of design and basic flower arranging skills. Welcome to the School of Flowers, a floral design school focusing on instruction in the art of European floral design, ikebana, wedding flower designs, event flower designs and artistic arrangements for everyday flower enjoyment. Our instructors are trained by International Master Floral Artist Petal M. Harvill at the highest skill level and bring cutting-edge ideas and color trends that go beyond the typical floral design classes. At our floral design institute, students learn flower designing from an artistic perspective in the French fashion of instruction which is unique to our floral arrangement classes. 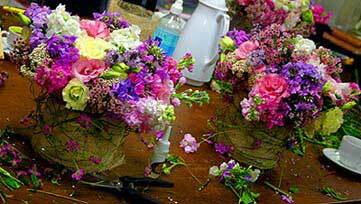 Our flower classes are not only a school for florists, but individuals who wish to learn flower arranging for a new career path or even fun and relaxation. Call or peruse our website to learn more about our interesting floral classes at our one of a kind flower school.